ASA Emulsifiers | ProFlow, Inc.
ProFlow has been building ASA emulsifiers for the paper industry for over 25 years. We’ve built in excess of 300 systems in various configurations. We offer standard designs for cooked starch, pre-cooked starch and polymer. Our SAE series of emulsifiers are designed to emulsify ASA in cooked starch and feed the emulsion directly to the paper machine. With ASA rate to 250+ Lbs/Hr and starch flows to 50+ GPM these standard skids fit a wide range of applications. The standard design features a NEMA 4 electrical enclosure, is PLC controlled including ratio control of starch to ASA, flow following mode for multi-ply splitter application and a graphical operator interface terminal to closely monitor all process parameters. 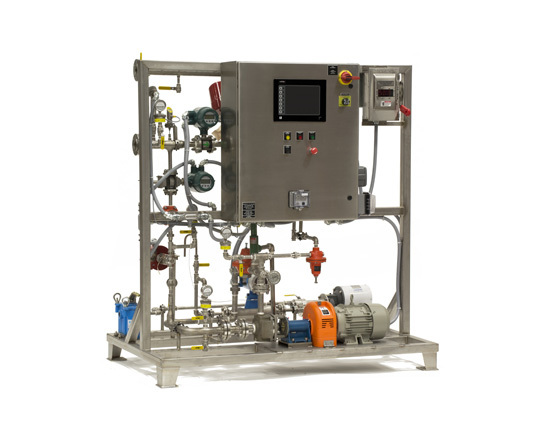 These skids offer the customer a compact design with a stainless steel frame, and piping, and are supplied pre-piped, pre-wired and ready to operate. 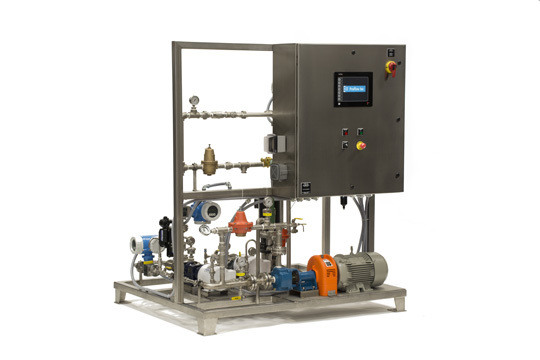 A full range of accessories is available including starch pumps, starch filters, emulsion filters and splitter systems for multi-ply applications. We have extensive experience with on-site startup services. Our service engineers have 20 years of worldwide ASA startup experience.